First Light From the M87 Black Hole: What Are We Looking At? How does a picture of a luminous ring around a black region square with the popular idea that black holes trap everything including light? 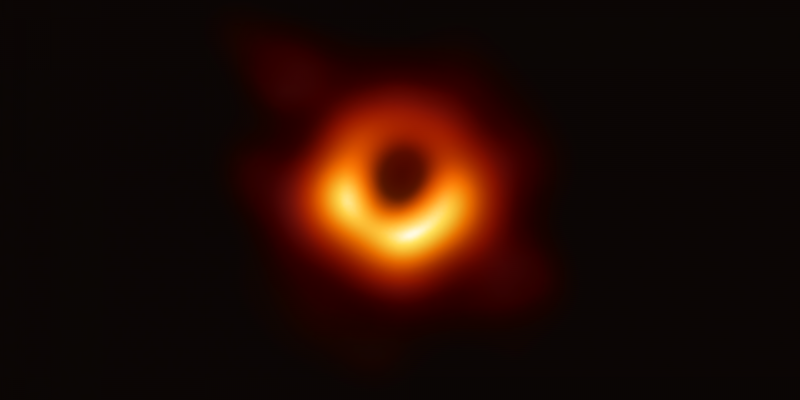 As everyone knows by now, the Event Horizon Telescope (EHT) has imaged a black hole in the galaxy M87. While astronomers already knew that black holes were real objects in the Universe, the picture provides direct ocular proof of their existence. But what exactly are we looking at? How does a picture of a luminous ring around a black region square with the popular idea that black holes trap everything including light? To understand this, let us step back a bit and ask what we mean by an image. It is true that black holes do not emit light. In this, they are no different from any other non-luminous object, like the reader and writer of this article. When you take a selfie, you use a flash to illuminate yourself. Selfies taken in total darkness are not the kind of image you can put up on Instagram. With a flash, the light bounces off your body and is received by the camera lens. More technically, we can say that light is scattered by your body into the camera lens and this is what produces the image you post on Instagram. The same is true for black holes. Imagine that we transport ourselves magically to the vicinity of an isolated non-rotating black hole – taking care not to fall in – and remembering to take a camera along. If we snap a picture of the hole, it would be sheer black, nothing to write home about. This fits with the popular belief that you cannot “see” a black hole, precisely because it is black. If you use the flash on your camera, the picture changes dramatically. Light from the flash is emitted in all directions. Imagine a line going from your camera to the centre of the black hole. Light going along this central line of sight to the hole will be absorbed and not return to your camera. This also applies to rays that make a small angle with the line of sight to the centre. Thus we expect a central dark region in the picture, the “shadow” of the black hole. Similarly, rays that are emitted at large angles to the line of sight will go nowhere near the black hole and disappear into space. The rays in between these extremes are more interesting. Rays going at angles closer to the line of sight will be bent by the gravitational field of the black hole. If the angle is small enough, they will bend all the way around the black hole and return to the camera! Since all rays making the same angle with the line of sight will behave the same way, we can expect to see a ring of light around the black hole. As the rays get closer and closer in, one would find an angle at which the bent ray goes twice around the black hole and returns to the camera. 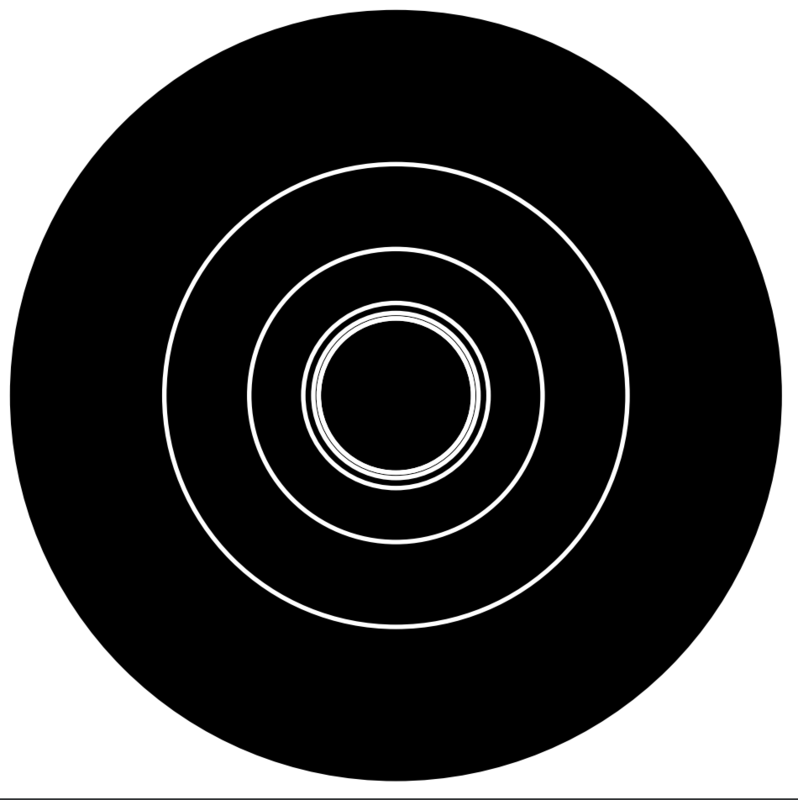 Thus, we get a series of concentric rings as shown in the image. The rings pile up near the innermost one, and for still smaller angles, we see only blackness. This is how a black hole scatters light. This is what a non-rotating black hole’s selfie would look like, if black holes were into selfies! Definitely worth posting on Instagram. Astrophysical black holes are not isolated, but accrete matter from neighbouring stars. This matter falls into the gravitational field of a black hole, and – if it has angular momentum – circles around the black hole just the way the planets circle the Sun. The gravity of the black hole pulls the gaseous stellar matter in, causing it to accelerate to near-light – or relativistic – speeds. Friction causes the gas to heat up and radiate energy. The hot disc radiates at all frequencies across the electromagnetic spectrum and this is the source of illumination that enables us to “see'” the black hole. Now, suppose we have a non-rotating black hole with an accretion disc in its equatorial plane and we view the hole from slightly above the plane. As we learned, we need only concern ourselves with rays of light that go from the light source (the accretion disc) to our eyes. In the absence of strong gravity and relativistic effects, we would expect to see a disc rather like the rings of Saturn. However, the relativistic speed of the swirling matter causes the radiation to be ‘beamed’: matter that appears to be coming towards us would appear to radiate more strongly and appear brighter, while receding matter appears dimmer. Further, some of the light emitted by the disc on the far side of the black hole would be bent toward us and we would see it as apparently coming from “above” the black hole. The final picture we see looks something like in the one below. Armed with the understanding gained from these idealised situations, we can begin to understand the the real image taken by the EHT. The black hole in M87 is rotating and, as a result, the picture is somewhat more complicated. But our qualitative understanding can still be brought to bear on the problem. If we trace the light that enters our eye backwards towards its source, it will go to the black hole, bend in the gravitational field and eventually end up at the source of light, in this case the accretion disc. Even if the disc is uniform, those parts that appear to be moving towards us will appear brighter due to beaming effects. We expect to find a ring of light with a dark spot in the middle representing those rays that fall into the black hole. The EHT collaboration performed a detailed simulation of a magnetised accretion disc around a rotating black hole. The researchers found its results agreed with their image. Now, let’s clear up a few points that we glossed over. We talked of “seeing'”, which colloquially means visible light is involved. In fact, the EHT works with radio waves whose wavelength is 1.3 mm. Eyes and cameras are replaced by a combination of telescopes spread all over Earth. The essential principle is still the same. The EHT uses a technique called very-long-baseline interferometry, or VLBI, to image the distant black hole with the accuracy of a microarcsecond, a feat of both technology and science. It involves spectacularly accurate time-keeping developed over the last few decades, and a fundamental understanding of the wave-nature of light developed over the last few centuries. So, are we looking at a black hole? Or is it an accretion disc seen through the distorting gravitational lens of the black hole? It is both, actually. When you take a selfie, you are looking at light from a flash scattered by the atoms of your body. To a physicist or an astronomer, there is no fundamental difference between light scattered from a black hole or from an atom. The disc is like the flash and the black hole is the scatterer. Take a good look at the dark patch in the middle of the image. You are staring into the desolate darkness of the event horizon. Wow! Joseph Samuel is a professor at the Raman Research Institute, Bengaluru.